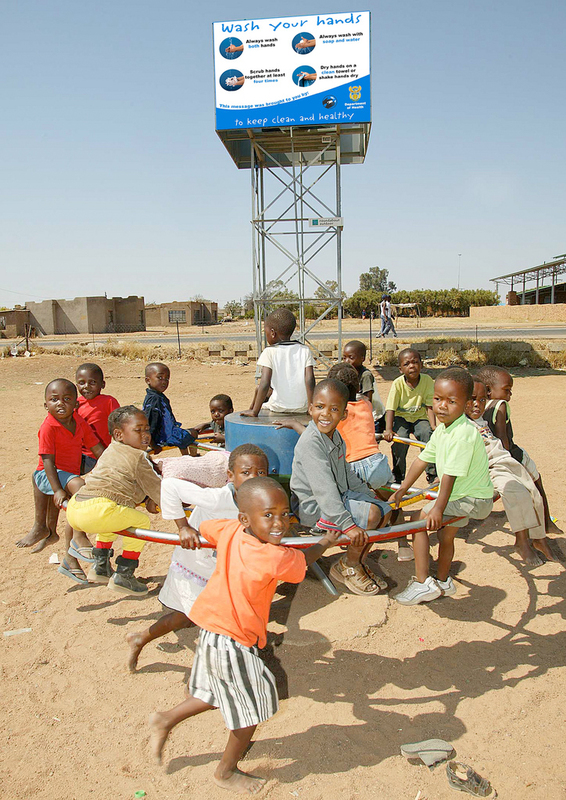 The PlayPump–a water-storing device fueled by children playing on a merry-go-round that forces water into a tank–has fallen out of favor within the international aid community. Across Africa, many PlayPumps are in need of repair while others have been removed and hand pumps have been re-installed. Several international aid organizations, including WaterAid and UNICEF, as well as the Mozambique government, have openly criticized the device; calling it too expensive, difficult to repair, and unsustainable. Save the Children, which was responsible for the installation of dozens of pumps in Mozambique, has been blamed for placing the devices in unsuitable sites and failing to respond to repair requests–at times leaving communities without access to water sources for six months. A report by Mozambique’s government indicates that Save the Children failed to test the water quality of many of the sites in which PlayPumps were installed. According to figures by the International Institute for Environment and Development (IIED), a global organization that conducts research on sustainable development, $US215 to 360 million in investment in water aid is wasted because of poor planning and implementation. The PlayPump failed, in part, because it was implemented before stakeholders properly discussed the appropriateness and viability of the technology. Additionally, the communities in which a PlayPump was installed were rarely consulted on whether they wanted the technology. “I think the haste to get pumps in the ground in order to fulfill an ambitious and arbitrary goal from Washington, likely contributed to instances of poor site selection and/or lack of community support for the device,” said journalist Amy Costello during her PBS Frontline World report, Troubled Water in June. Ironically, Costello’s 2005 report on the device had ignited international attention and investment in the project. One year later, the Clinton Global Initiative Conference raised US$16.4 million for the installation of PlayPumps. Eventually, Trevor Field, the South African entrepreneur who invented PlayPumps, teamed up with the Case Foundation to create the PlayPumps International (PPI) non-profit. The PlayPumps Alliance, comprised of PPI, the Case Foundation, USAID and other private sector partners sought to raise US$60 million by 2010 to provide 10 million people in 10 sub-Saharan African nations with access to clean and safe drinking water through the installation of over 4,000 PlayPumps. Due to the uncertainty of the technology’s sustainability, the Case Foundation stopped installing the pumps. A blog post issued by the Case Foundation in May publicly acknowledged the challenges of the campaign, and by the month they conceded that, despite millions of dollars invested, PPI had fallen short. PPI granted Water for People the remaining PlayPump inventory. Water for People plans to incorporate it as an option for aid work. According to Costello, PlayPump’s supporters saw it as a versatile solution—one that could work in a variety of locations. “Various parties have told me that they learned that the best approach for bringing clean drinking water to Africa is to offer not just one solution like the PlayPump. Instead, all parties are now moving to offer an array of water solutions and technologies tailored to the individual needs and circumstances of different villages,” Costello said. Clarissa Brocklehurst, the chief of water, sanitation and hygiene at UNICEF, concurs with Costello’s observations, and expanded on the lessons learned from the PlayPump in an interview for Troubled Water. “You need a multitude of solutions involving a multitude of agencies. We need to look at the most local solution possible and bring the power of people. Our solutions have to be based in local capacities–what the capacity of the local private sector is, what people can afford. We have to use our heads and our imaginations. And we’ve got to think less about what is the magic bullet and what is the best technology, and more about how to come up with a tailor-made solution that suits the capacity of the people we’re trying to help,” Brocklehurst said. I was amazed to read on the BBC website today that the organization One Difference is selling it’s brand of bottled water ‘One Water’ to support playpump projects across Africa. According to their FAQs (http://www.onedifference.org/faq) they have are building playpumps at a rate of one playpump every 3 days and have installed a total of 536. I was under the impression that the playpumps organization was disbanded and the remaining stock handed to Water for People. Frankly this stinks of fraud. I think you’ve picked up on a few mixed messages which are, unfortunately, floating around on the web, some old, some inaccurate, and to say that “The Playpumps organization has been shown to be a fraud following…..” couldn’t be further from the truth. In fact PlayPumps International was created by The Case Foundation – Steve Case being the (billionaire) founder of AOL and he ad his wife, Jean, being some of America’s foremost philanthropists. There are also some mis-informed reports which have been re-tracted by the NGO’s you mentioned after it was discovered that the contractors they’d been using for installation were actually not, how shall we say, being completely honest in their analysis. As a charitable foundation we have a board of trustees who’s job it is to separate fact from fiction, and spin from the realities of life. If we, and me personally, had any issues (and we do a lot of background checks – some of them in a ‘mystery shopper’ type format) we’d stop what we were doing.